If you’d been hanging out around this area in, say, 1777, you would have seen a fort down near the river, at a location that’s probably been obliterated by Tennessee Eastman or the plant that preceded it. That would have been Fort Patrick Henry (nowhere near the dam that carries the name). However, the tunnel wouldn’t have been here, since it was completed in 1927 1913 or so. 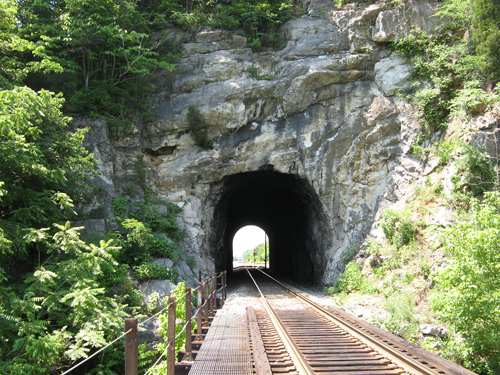 There are just three more tunnels in Tennessee before the rail line heads into the Appalachian Mountains (and that’s ap-UH-latch-ian, not ap-UH-lace-ian) (’round here). This tunnel is 154′ long. 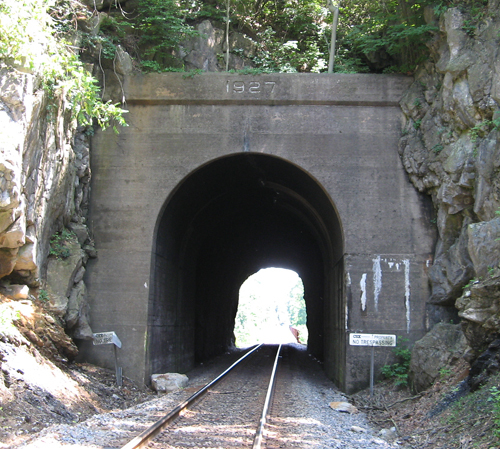 First is the western portal, then a look back at the eastern portal. A bridge here (which can be clearly seen on Google Earth) overlooks the old Kingsport waterworks and the never-completed 3-C railbed. Over the river and on to Colonial Heights.